(DEGUI, DEWI). Bishop and Confessor, patron of Wales. He is usually represented standing on a little hill, with a dove on his shoulder. From time immemorial the Welsh have worn a leek on St. David's day, in memory of a battle against the Saxons, at which it is said they wore leeks in their hats, by St. David's advice, to distinguish them from their enemies. He is commemorated on 1 March. The earliest mention of St. David is found in a tenth-century manuscript Of the "Annales Cambriae", which assigns his death to A.D. 601. Many other writers, from Geoffrey of Monmouth down to Father Richard Stanton, hold that he died about 544, but their opinion is based solely on data given in various late "lives" of St. David, and there seems no good reason for setting aside the definite statement of the "Annales Cambriae", which is now generally accepted. Little else that can claim to be historical is known about St. David. The tradition that he was born at Henvynyw (Vetus-Menevia) in Cardiganshire is not improbable. He was prominent at the Synod of Brevi (Llandewi Brefi in Cardiganshire), which has been identified with the important Roman military station, Loventium. Shortly afterwards, in 569, he presided over another synod held at a place called Lucus Victoriae. He was Bishop (probably not Archbishop) of Menevia, the Roman port Menapia in Pembrokeshire, later known as St. David's, then the chief point of departure for Ireland. 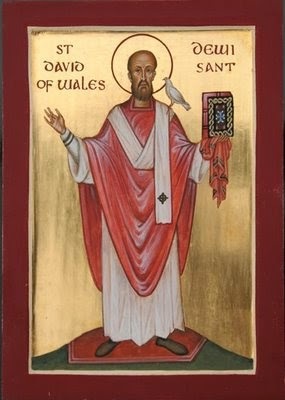 St. David was canonized by Pope Callistus II in the year 1120.